The Federal Reserve has revealed that it is considering scaling down and possibly even completely halting quantitative easing by the end of this year. Whether or not the central bank will actually be in a position to do that in 2013 is one of the hottest debates in the market right now – but the 10-year U.S. Treasury yield has risen from an all-time low below 1.5 per cent in July to its current levels, slightly above 2 per cent, and that has people talking. “It’s the $64,000 question: What ends up bringing this down?” Citi strategist Michael H. Anderson told Business Insider. As several members of the Federal Reserve ramp up the public dialogue surrounding financial stability, Anderson thinks they’re looking in the wrong place. In aggregate, investors have poured a staggering amount of money – hundreds of billions of dollars – into bond funds over the past five years. They have been largely deterred from stocks as memories of the crash in 2008 continue to haunt the market. That may all be changing as investors in mutual funds begin to open up their monthly statements and realise that their bond investments are starting to lose money. What happens when investors start pulling money from these mutual funds, and the fund managers have to turn around and get rid of their holdings of corporate bonds? No one knows for sure. This is an unprecedented situation. However, one thing is clear: that scenario could present a big problem. The chart below is a perfect illustration of what has Citi worried. The corporate bond inventories of these dealers – big Wall Street banks like Citi – are a casualty of Dodd-Frank regulatory reform, which forced banks to reduce their own balance sheets. The negative side-effect of this particular aspect of the law should by now be clear. The answer, as far as anyone can tell, is maybe not. Before Dodd-Frank, Anderson told Business Insider, dealer inventories provided a buffer for these types of situations (albeit on a smaller scale). 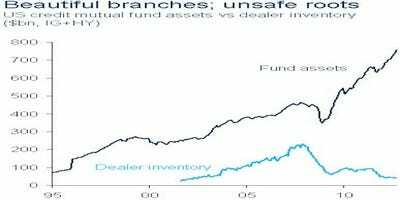 Sellers – mutual funds, for example – were able to unload their bonds to the dealers, who would hold on to them just long enough to find another buyer for them. In other words, the “buffer” of higher inventories on bank balance sheets provided the market with liquidity. Now, that buffer is gone. “If [the dealers] don’t feel comfortable that they are going to quickly find a buyer on the other side – because the dealers don’t want to be sitting on a whole bunch of paper – if the dealers are not confident in that, then they are going to be hesitant to provide that liquidity,” Anderson told Business Insider. Perhaps the biggest risk building in the market is the decline in liquidity. Although volumes were higher in 2012 than 2011, we believe a lot of the improvement had to do with a strong market and inflows that made traders confident they could move risk. High yield TRACE volume rose 18% in 2012 and the average daily volume was $5bn, versus $4.2bn the prior year. We are not confident that liquidity improvement will be maintained in a prolonged market sell off. In addition, trading volumes last year were roughly equivalent to volumes in 2007 but when we adjust for increasing market size, turnover is much lower. Dealer inventories rebounded a bit at the end of 2012 but are not far above decade-long lows. Regulations and stringent capital constraints are limiting how much liquidity dealers are providing and perhaps policymakers should focus on creating an environment conducive to secondary liquidity. Therefore the market has grown in size beyond its ability to provide liquidity. This doesn’t cause problems as long as capital flows are positive (i.e. inflows) or balanced. What happens when investors begin to shift their allocations to other assets? How well will the sell-side accommodate the transfer of risk from current holders to the new holders? This is one of the bigger risks building in the credit market. That is how the entire bull market in credit could come to an end, says Anderson. The “Great Rotation” out of bonds and into stocks doesn’t appear to be here yet. Perhaps it will never arrive, though at this point, the consensus view is that it happens in late 2013 or 2014. If the hundreds of billions of dollars that have flowed into credit mutual funds in the past five years reverse with any similar magnitude, this nightmare scenario, wherein no one wants to buy these bonds until the dust settles, could become reality. Thus, as Anderson warns in his note, policymakers may want to look at this corner of the bond market a little more closely.